Any kind of fishing pole will do (I've even made use of broomsticks and buggy whips!) as will any kind of wing. In a pinch you can even use a handkerchief or other light fluttery piece of cloth! Game bird wings are good; I prefer a full pheasant wing; some folks will use just a couple of feathers. Wings can usually be had for the asking at field trials, hunt tests, fun days, training sessions, and from field trainers and game bird farms (who may charge a nominal 25 cents each or so.) You don't have to do anything to preserve the wings and you can store them easily in Ziploc bags in the freezer. Remove them as needed and there should still be a lot of scent to them when thawed. You can purchase small bottles of various game bird scents at sporting goods stores or through sportsmen's catalogs to refresh the wings, but remember that most of the attraction of the rod and wing exercise is visual rather than olfactory. Use a fairly heavy grade of nylon fishing line or household twine and tie the wing to the rod, allowing it to dangle two-five feet beyond the end of the rod; you'll soon find your own most comfortable position. You don't need to pierce the wing to attach the line; just draw it tightly through some of the long feathers, work it down to their base, and tie a good knot. Drop the wing onto the ground a small distance away from the pup. Let it hit hard enough to make a soft plop. When the pup notices it, hold it motionless as he begins to approach it. When he is within an inch or two of contact, begin to pull it along the ground away from him, at a pace that he can just keep up with. Try to avoid letting him actually catch the wing. If that happens (and it will!) praise him and stroke him gently while he has the wing in his mouth or under his feet. Then gently ease it away from him and begin the procedure again. If the sound of the wing falling to the ground fails to attract your pup, try lifting it up onto one edge and letting it flutter back and forth in the his line of sight. Do not at this time jerk the wing around rapidly, or let it land loudly directly behind him, and by no means ever drop it directly onto him! If your pups fails to respond to the wing with enthusiasm, then your timing may be off in one of two ways: Either your use of the wing is too unskilled to kindle his interest (not likely!) or the exposure is inappropriate at this moment. It may be too hot; he may be too full or too sleepy to play; he may be upset from recent shots or worming; or he may actually be ill. Try him again later. As the pup working the wing grows more confident and enthusiastic, you can begin to move the wing faster along the ground or actually flip it through the air a few inches above the ground and drop it briefly in different places. Try always to keep it within the pup's line of sight. If he loses it, let him search for it briefly. If he can't locate it, pull it along the ground or flip it through the air and drop it into his sight; then let it flutter on edge a bit to attract him. During this play you may also encourage the pup verbally, saying such things as, "Good boy/girl...where's the birdie? See the birdie; find the bird; good dog!" Only positive praise should be used, and it is best if only one person talks. Words coming from several directions may serve to confuse and distract the pup. If the pup catches the wing DO NOT chastise him or shout, "No!" or "Bad dog!" Remember, all aspects of birds are to be positive and you don't want to tell the pup he's bad for catching the wing when you'll be asking him later on to retrieve a bird for you! Praise him for catching that wing (after all, it's you who was clumsy for letting him do it!) Say, "Good pup, you got the birdie!" Don't drag the wing out of his mouth, but encourage him to carry it, and praise him whether he brings it in your direction or runs away with it. The point is that he has demonstrated willingness to move while carrying feathers in his mouth, a positive sign of retrieving potential. Let the pup carry the wing a few feet. Then go to him, or keep him by you if he has come to you. While he is holding the wing in his mouth, stroke his back, tell him what an absolutely wonderful little pup he is, and then either gently pry the wing out of his mouth or blow softly into his nose and take the wing when he releases his hold. He may release the wing immediately, will more likely take several chomps on it while resisting its removal, or may release it and bite you hard for taking it away. Either reaction is acceptable; to me the second shows a bit more strength of character and self-confidence. In either case, the wing should be put out immediately for the pup to work again, until his attention span wavers. Never overwork the pup. As soon as his attention span falters, put the wing away. Look for length of attention span to increase with time and the number of exposures. 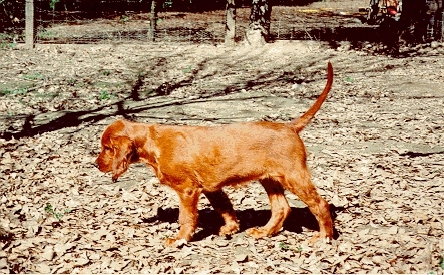 As the pup responds with enthusiasm to chasing the wing, you should begin to notice a new phenomenon: After a series of rapid starts after the wing, the pup may suddenly slow down in his pursuit of it. He may drop his body into a crouch, perhaps with stiff tail; or he may prance forward with high head and tail, thrusting a forepaw out with each step: He is beginning to learn to stalk. As his advancing movements get slower and slower, he may freeze in mid-stride only inches from the wing. Look fast, because this is his first point! To be followed almost immediately by a quick pounce at the wing! At this time it is quite essential to flick the wing away just as the pup breaks his point and begins to pounce, since he needs to learn to hold point on his birds, realizing that the bird will fly away if he jumps at it but will stay in place as long as he stays on point. If you happen to misjudge and he does capture the wing, repeat the praising procedure as above. Remember: NO NEGATIVE CORRECTIONS ABOUT BIRDS!!! Hopefully by the second or third exposure you can get your pup to hold point for several seconds. Work the pup on the rod and wing briefly at least every second or third day. Make your sessions short and positive. Try to end on a positive note before the pup tires of the activity. It's good to quit when he still wants more! He'll be that much more eager the next time.